Our AERODEFENDER™ Wheel Fairings represent one embodiment of a range of very recent drag-reducing inventions, some of which have the potential to save significant fuel in the trucking industry, while others can enhance performance in the race car world. The following introduction offers a glimpse into our technology. However, for a more detailed appreciation, please see the expanded explanations under the sub-menus in this category, preferably in the order listed. 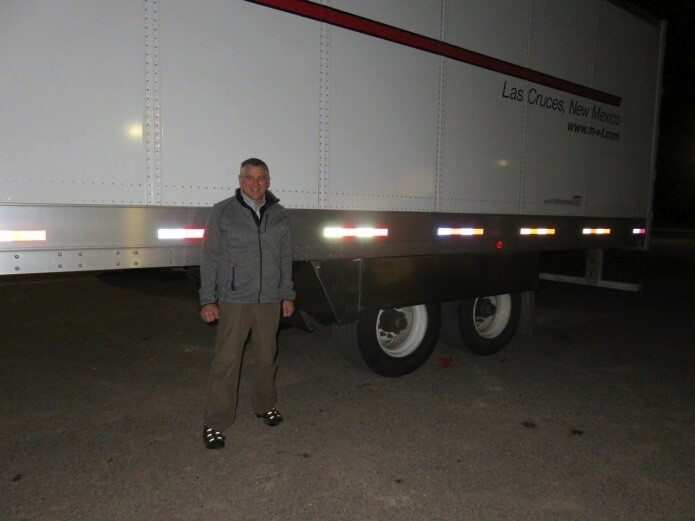 First Fuel Economy Road Test of Upper Wheel Deflector Invention for Semitrailers. 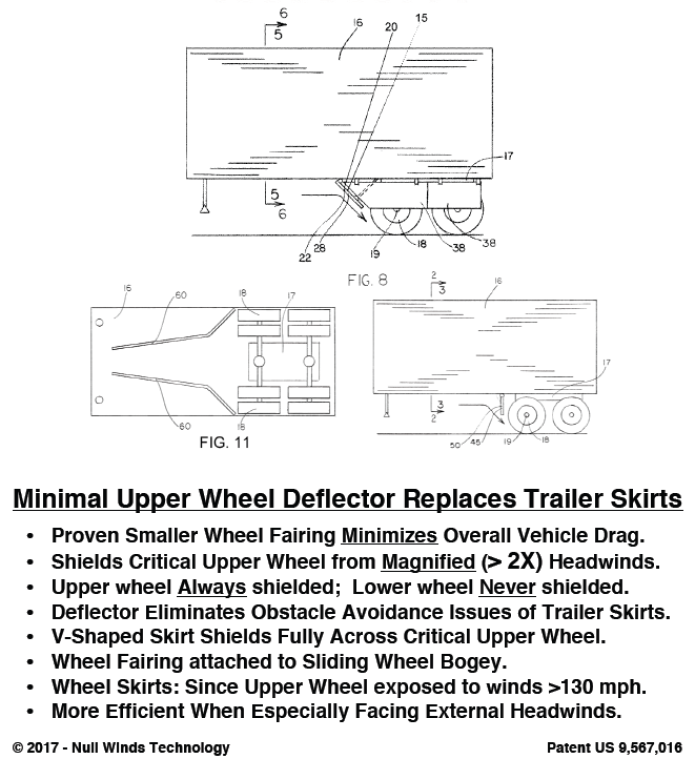 For example, NULL WINDS Technology™is currently developing enhanced patented trailer skirts and upper wheel shielding deflectors for use on semitrailers. Preliminary road testing has already confirmed potential performance increases, with even more road testing just concluded this past April, 2018. Inventions include numerous embodiments for shielding the upper wheel on semitrailers. Our new designs can increase fuel savings over currently employed trailer skirts, saving untold gallons of fuel pulling the millions of semitrailers on the road today. However, this industry is also slow to adopt significant change, with truck fleet operators often skeptical in this conservative field. Demonstrating progress in drag reduction on bicycles could help project change into this industry as well, saving significant burning of fossil fuels. And the auto racing world (as well as the motorcycle world)also needs to consider shielding the upper wheel — rather than their current preference for shielding the lower wheel — not only for increased speed, but perhaps more importantly, for increased safety. 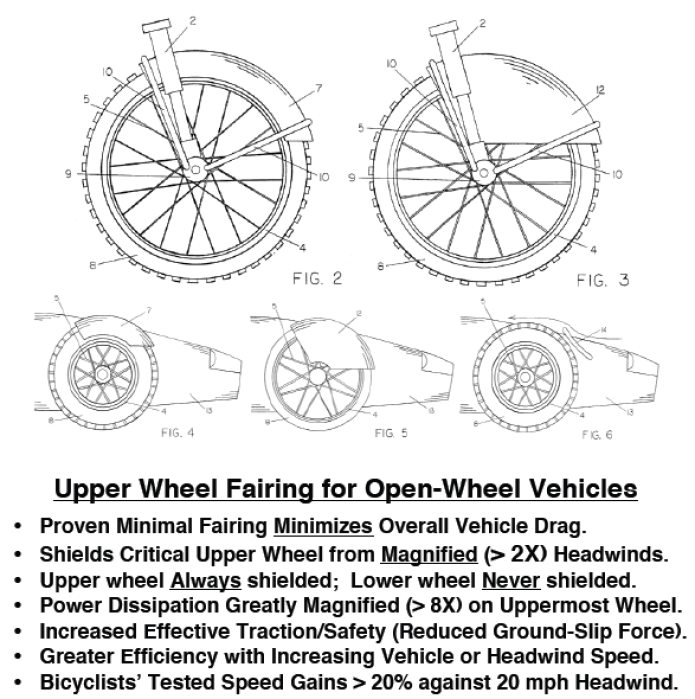 Our patents teach that a by-product of shielding the upper wheel is enhanced cornering traction. This increased cornering traction is quite noticeable on bicycles at faster speeds in corners, and becomes particularly noticeable when cycling fast downhill. Inventions include five embodiments for shielding the upper wheel on various vehicles. While race cars use low front wings to develop downforce for more traction, their exposed upper wheels actually reduce traction — by imparting greater counter-torque on the upper wheel for a loss of cornering traction— thereby being counterproductive when it comes to both drag reduction and steering control. Still, the auto racing industry is also slow to adopt new concepts, as there exists bias towards using established methods. Demonstrating progress on bicycles may then help influence change in other industries.